This page contains various write ups describing modifications and enhancements for NCE’s DCC equipment. (*New*) A Battery Charging station for NCE radio cabs. This write up describes a Battery Charging Station that allows “Charger Equipped” radio cabs to be charged independently from your layout. The charging station can charge up to eight cabs at a time while providing feedback of the charging state. A built in timer will turn off each charger port after 24 hours of continuous charging. The Charging Station assemblies are available from the author. Click here to see more about the Battery Charging station. This write up shows an easier way to install a battery charger in any radio cab. The battery charger described below has been implemented on a small circuit board that can be easily installed into any radio cab. 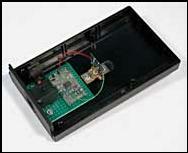 This write up shows how to install the charger board assembly into any radio cab. 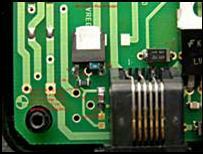 These charger board assemblies are available from the author. Click here to download the Battery Charger write-up. This write up describes how to add a battery charger circuit to radio ProCab’s. The circuit goes inside the ProCab and recharges the batteries whenever the ProCab is plugged into the cab bus. For use with NiCad or NiMH rechargeable batteries. Click here to download the file in PDF format (procab.pdf, 746k). This write up shows you how to install the components to enable the battery charger in the new Cab06R. By installing four parts the Cab06R will trickle charge the batteries any time the cab is plugged into the cab bus. For use with NiCad or NiMH rechargeable batteries. Click here to download the Cab06 write up in PDF format (Cab06-charger.pdf, 456k). Some early System One Cab04’s (DIP switch addressing) can sometimes have a problem where the keyboard and the Select Loco key become non-responsive when operating on radio. This write up describes the problem, why it happens, and provides a simple resistor change to fix the problem. Click here to download the Cab04 write up in PDF format (Sys1_Cab04_Radio_Fix.pdf, 279k). This write up describes why radio ProCabs and PowerCabs can be hard to turn on. After explaining the problem a simple one part modification is shown that will fix the problem. After modification a radio ProCab or PowerCab will power up every time the ESTOP key is pressed. Click here to download the write up in PDF format (turnon.pdf, 368k). 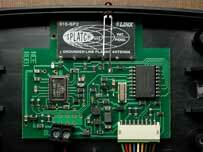 This write up describes how to install an internal Splatch antenna on the radio board module used in the radio cabs. Eliminates broken off antenna connectors. This write up describes a few simple modifications to the Power Pro that enable it to read most sound decoders without needing a programming track booster. This is a write up that explains the function of the setup jumper in the RB02 radio base station. This write up describes how to construct a second receiver for the NCE radio command station. This is also known as a diversity receiver and can improve the radio path reliability by providing multiple radio paths. This is also part one for the next article below that describes how to make a repeater for the NCE radio system. Click here to download the diversity receiver file in PDF format (diversity.pdf, 604k). 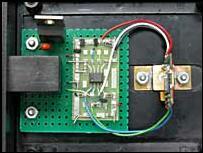 This write up describes how to make a repeater for the NCE radio system. This allows for multiple command station transceivers to improve the radio path coverage and to extend range if needed. The diversity receiver article above is part one to this write up. Click here to download the repeater article in PDF format (repeater.pdf, 490k).